I started back at work this week and as things have been quieter than expected these past few days, I have had some time to think about the year ahead. While I used to be a firm believer that New Year’s resolutions were a waste of time (and, in the case of gym memberships signed up for on 1 January, likely a waste of money too), the older I get, the more benefit I see in them. I am all in favour of exercising regularly, feeding yourself nourishing food with the odd feast thrown in for special occasions and generally being kind to ourselves and others, but I also know that life has a habit of making all these good habits rather difficult to keep at times (whether through stress in the workspace or at home). These days, I embrace the New Year as an opportunity to take stock of where I am in my life and where I want to be in my life (and how to get there). And from there I work out a list of aims for the year, aims big and small. There was plenty of big stuff last year – an exciting job offer, the move to Brussels for example. This year, I have some smaller aims, and one of them is to sleep more. With a job that has a habit of shortening the amount of shut eye I get during weeknights (and on occasion on weekends too), rather than make the most of the nights I leave the office early enough to get some much needed sleep, I seem to have turned into a bit of a night owl, often not going to bed until 1 or 2am – making the 7am wake-up call during the week rather painful. I am trying to get into a habit of going to bed before midnight again and so far, it’s working. I am also excited to shake up my exercise routine a bit. While regular runs and gym sessions are key to my sanity, I was getting rather bored with both until I started practicing yoga regularly back in September. While I used to do Bikram Yoga back in London, I never attended other types of yoga classes until now and I have been really enjoying learning a new skill, even if the first few classes left me feeling rather clumsy. Yoga also seems to have the added benefit of making me sleep like a baby the night after a class, so there is that too. I am also starting swimming again, something I haven’t done for exercise since my early teens. This year is already starting to look pretty busy with 3 trips across the channel planned for the next 3 months alone (for work, to attend a friend’s hen night as well as for a wedding) and several trips back home to see my family pencilled in my diary (not to mention my regular trips to Italy to see Alessandro). Yet I am actually hoping for a somewhat quieter year. With several trips each to Copenhagen, Zurich, London and home to Germany, a trip to Laos and Thailand, a week’s skiing and a week in New York and numerous Italy trips, not only have I lost count of the number of flights and trains I took last year, I have also been craving some quality time at home. I am looking forward to exploring Brussels more and I am also looking forward to making the most of the big kitchen in my apartment by cooking my way through the latest additions to my cookbook collection and all those recipes I keep on bookmarking. After all, it was the kitchen I fell in love with when I first saw the apartment and is also the reason I ended up renting a slightly awkwardly shaped open plan apartment on the third floor of a building without a lift and a staircase without handrails. 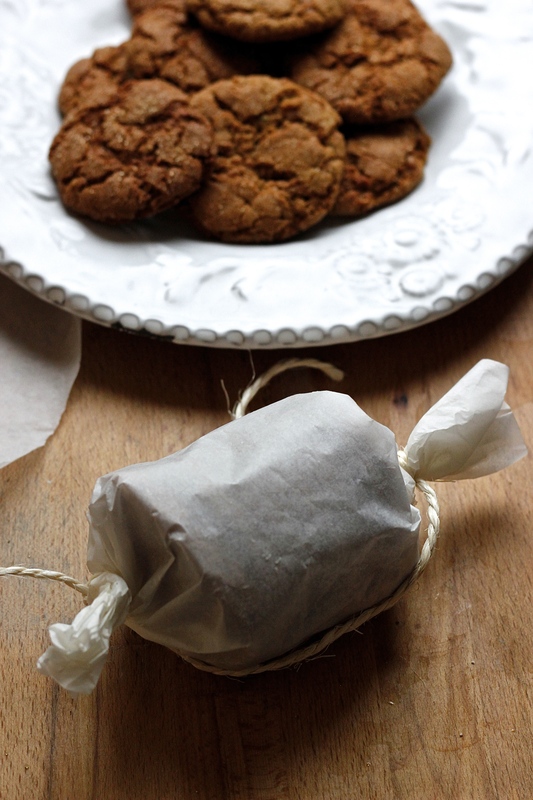 One ingredient I am very excited to play with in my kitchen at the moment is chickpea flour. A pantry staple of mine for a few years already ever since I discovered just how delicious farinata (the thick rosemary and olive oil flavoured chickpea pancakes from Italy’s Liguria region) is, I only recently started using it for anything other than farinata or as a binding agent when making vegetable fritters. Well, it turns out chickpea flour is very versatile- it makes incredibly moreish chocolate chip cookies, it can be used to make all sorts of flatbreads (I have even made tortillas with it) and crackers and can also be turned into pasta (high on top of my list of things to try!). For other ideas on what to make with chickpea flour, this article on Food52 by Lindsey might give you some ideas. 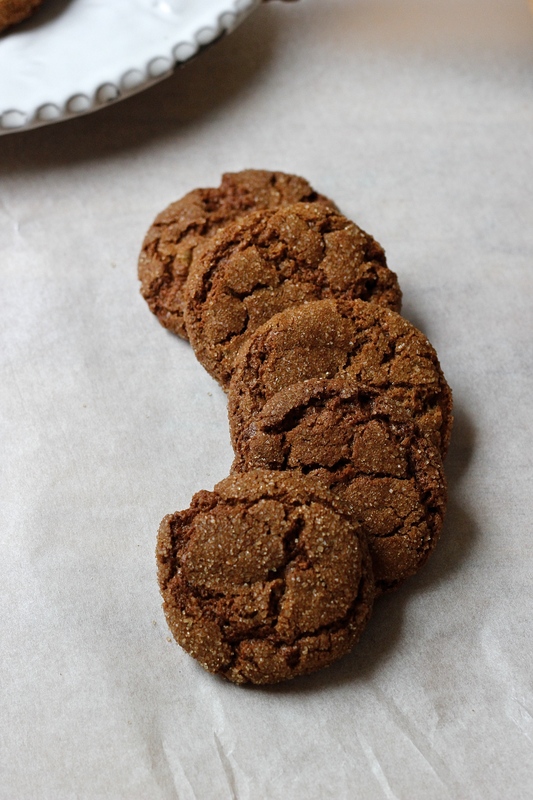 When I came across recipe for chickpea flour gingersnap cookies on Erica’s blog, I knew I had to try them. The older I get, the more I like bold ginger flavours and I was hoping the slight earthiness of the chickpea flour would compliment the spiciness of the ginger rather well. And what can I say, these were a total hit. I wrapped some to take home with me to Germany over the holiday and both my parents and siblings loved them as well. In fact, we ended up having these alongside the grapefruit possets we had for dessert on 25 December and the zingy, chewy yet crunchy cookies were the perfect contrast to the tart and creamy possets. Next time I make them, I might even add some dark chocolate chunks or cacao nibs to the dough as well – there is something about the spiciness of ginger that I find goes really well with earthy and bitter dark chocolate. As the only two changes I made to Erika’s recipe were to use maple syrup instead of the honey as well as adding 50g of finely minced crystallised ginger to the dough, rather than re-copy her recipe here, I suggest you had to her blog for the recipe. A tip, while most organic stores will stock chickpea flour, it can often be bought more cheaply (albeit not organic) in Asian supermarkets.